Egypt has the largest Christian community in the Middle East. Officially, Coptic Christians comprise about 10 percent of Egypt’s 96 million population. About one million are members of the evangelical community. According to Open Doors, Christians are facing “unprecedented” levels of persecution. “The rise of radical Islamist groups has only exacerbated Christian persecution, affecting believers in their villages, neighborhoods and workplaces,” said Open Doors on its website. Each year, Open Doors publishes a list of countries where it is most difficult to live as a Christian. Egypt ranked 17th on this year’s list. Some experts say that since Egypt’s president Abdel-Fattah el Sisi came to power in 2014, the conditions for Coptic Christians have improved. “He has done some things that no leader in Egypt has ever done in all 1,400 years of Islamic rule in Egypt,” claimed Dr. Michael Youssef, founder of Leading the Way ministry. Michael Youssef and several other prominent American evangelical leaders met with Egypt’s president last year in what was described by some attendees as a historic meeting. Earlier this year, Sisi told Coptic Christians that Egypt would prevail over Islamic extremism. “You are our family, you are from us, we are one and no one will divide us,” the president said. 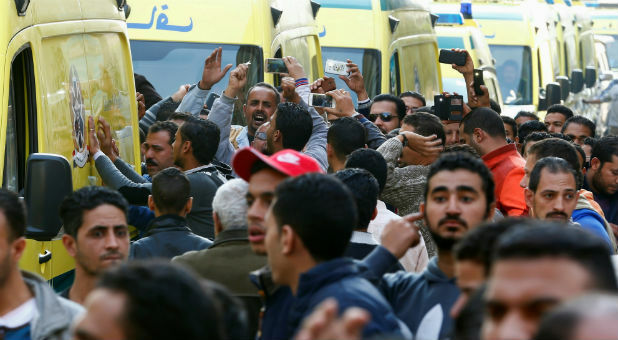 Four Islamic jihadists were killed on Sunday in Egypt’s Sinai peninsula as part of the government’s ongoing campaign to rid the region of terrorists. In addition to targeting Egyptian soldiers, police officers and civilians. jihadists have also killed scores of Christians in church bombings and shootings. Facing little contest, president Sisi won a second term in office this month after winning 97 percent of the vote in a presidential contest. Many Coptic Christians, who remember what life was like under the Muslim Brotherhood, voted for him.